The scale of ecological crises made us realize that every kind of politics has always been cosmopolitics, politics of a cosmos. Cosmos embraces everything, including the multifarious natural and material entities that make humans act. 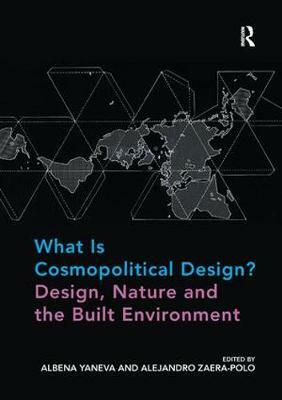 The book examines cosmopolitics in its relation to design practice. Abandoning the modernist idea of nature as being external to the human experience - a nature that can be mastered by engineers and scientists from outside, the cosmpolitical thinking offers designers to embark in an active process of manipulating and reworking nature 'from within.' To engage in cosmopolitics, this book argues, means to redesign, create, instigate, and compose every single feature of our common experience. In the light of this new understanding of nature, we set the questions: What is the role of design if nature is no longer salient enough to provide a background for human activities? How can we foster designers' own force and make present what causes designers to think, feel, and act? How do designers make explicit the connection of humans to a variety of entities with different ontology: rivers, species, particles, materials and forces? How do they redefine political order by bringing together stars, prions and people? In effect, how should we understand design practice in its relation to the material and the living world? In this volume, anthropologists, science studies scholars, political scientists and sociologists rethink together the meaning of cosmopolitics for design. At the same time designers, architects and artists engage with the cosmopolitical question in trying to imagine the future of architectural and urban design. The book contains original empirical chapters and a number of revealing interviews with artists and designers whose practices set examples of 'cosmopolitically correct design'.